For the best experience, choose the top for your conference table in your style. We have over a dozen wood styles, some with barkline options. Pick a frame color and leg style that goes well with your desktop style and office accents. Our accessories will match your frame color. Organize your wires with a wire management kit that moves in tandem with your conference table! Free! Add a combo of accessories on us, including a standing mat or motion board, which will help you stand more comfortably at your new conference table. Easily move your table with locking standard or heavy duty casters. It makes optimizing and organizing your space easier than ever! Style your desk with your choice of several real wood tops, Eco, or classic laminate, all 80" so you can bring everyone to the table. Get a Height Adjustable Conference Table by UPLIFT Desk in your choice of two or four legs. Our wide selection of desktop options means you'll have a style to fit any boardroom. Our T-frame feet are symmetrically designed, to keep things comfortable and uniform on both sides of the table. Desktops are cut to a wide 80" width, to make sure there's plenty of real estate available. UPLIFT frames are available in black, metallic (industrial style), gray, or white finishes. Choose a unique desktop and frame and start customizing your Height Adjustable Conference Table by UPLIFT Desk today. Invigorate your body and your brain during long meetings by bringing the benefits of a sit stand workstation into the conference room. Standing meetings can help boost productivity and creativity, and when you've been on your feet too long, you can lower the table to take a seat - and a rest. UPLIFT Desk is proud to introduce a line of height adjustable conference tables designed to keep you comfortable and alert as you work through your projects and reports. Sit, stand, lean, or perch as the mood strikes you. Did you know that standing can even help you and your coworkers wrap up meetings sooner, saving time for other tasks? Or for long meetings at this sit-stand conference table, you'll be able to stay comfy because you'll have freedom to adjust to your sitting and standing heights. Just stand when sitting becomes uncomfortable or you feel yourself becoming fatigued. Working a sit-stand conference table allows you and your team to conduct more productive meetings, giving you more energy and comfort than you ever thought possible at work. This conference table includes your choice of a black, white, metallic (industrial style), or gray 2-leg or 4-leg frame, steadied by UPLIFT's distinctive stability braces, to eliminate lower crossbars for a minimalist contemporary design with maximum legroom. There's enough room here for six users to sit or stand comfortably around the table with space to stretch their legs. Every workplace has a style all its own, and we want your UPLIFT Conference Table to fit perfectly into yours. That's why this height-adjustable frame is designed with three different finish options, and offered in a wide variety of desktop colors and styles, including GREENGUARD-certified laminates, natural bamboo, and many 100% solid wood options. Desktops start at 0.75" thick, with solid wood options cut to an even more luxurious 1.75". UPLIFT's thicker desktops make for stronger, more resilient desks, and all are built with eco-friendly manufacturing practices and the greatest care given to quality. We work to give you the best sit stand solution available by building every conference table with UPLIFT Desk's distinctive all-steel three-stage frame. While some sellers will make their three-stage frame desks and tables available for an upcharge, we hold our products to the highest possible standards. That's why each conference table and standing desk we sell features the three-stage frame that adjusts 33% faster than its two-stage competitors, and offers 33% greater height adjustment range while doing it. Want to do the math? That's a height adjustment of 24.4" to 50.0" without the desktop, at 1.57"/second vs. 1.18"/second travel speed. A dedicated motor in each leg even keeps your conference table running at a quiet 46 dB during movement, even when lifting up to 355 lbs. The biggest innovation comes from the frame's inverted leg design, which is thicker at the top than the frame. This construction allows us to include our unique stability braces, which steady the tabletop against side-to-side shake at even the highest extension, removing the need for the lower crossbar system required for stability on other brands of desks. A collaborative space like a meeting room requires maximum space under the desk, to open up legroom for users to sit comfortably on all sides of the table. We've eliminated the need for the lower crossbar to accomplish that, without sacrificing the desktop support of the upper crossbar. The sleek, elegant look of the UPLIFT three-stage frame is available in four color finishes in a 2-leg or 4-leg style. Pick your look and start building! Use your UPLIFT Conference Table to its full potential with the Advanced Digital Memory Keypad. Since you won't want to distract from your meeting while adjusting your desk, the keypad includes four programmable height memory buttons to store preferred sitting and standing heights. Get back to the right height for your group with one touch of a button, and then keep the table there, even against careless fingers, with Keypad Lock. By temporarily locking the height adjustments on your conference table, you can make sure your desk stays still when it should. Those aren't the only features that make this keypad "Advanced." Its LED display shows the table's current height, and numerous customization options such as measurement display in inches or centimeters, and the ability to switch between one-touch and constant touch height adjustments also contribute. 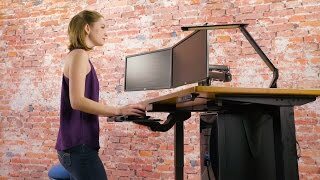 Programmable upper and lower limits will help prevent accidents by pre-setting points at which the desk should not adjust any further. Safety Features: Did We Mention Protected Knees? This conference table fits at least six people - that's a lot of knees and feet under there. The UPLIFT anti-collision safety features will protect them as the table raises and lowers. State of the art sensors stop the table’s movement in bare fractions of a second if the table comes into contact with someone or something while it's adjusting. The table then slightly reverses direction to let you get whatever was blocking its path safely out of the way. We're dedicated to making every UPLIFT Desk purchase the best value it can be. That's why our industry-leading desks and conference tables come with free helpful accessories! With your conference table, choose a free bamboo or vibrantly colorful desk organizer set to ensure every thing is stylishly in place. Each set includes paper organizer trays, a box for clips and sticky notes, a pencil holder, and more. Let UPLIFT keep your boardroom neat and organized! As with most large furniture, some assembly is required, but we've put in the effort to make it quick and easy. Have a look at our assembly video to see for yourself how fast and easy it can be. The best-in-class value and quality of this conference table will serve you and your company well over the coming years and into the future. DIY not your cup of tea? White-glove installation service is available. Select this option at checkout, and our agents will build your conference table for you, in the room of your choice. Select free shipping at checkout for service via FedEx Ground from Austin, TX, at no cost to you. Your Height Adjustable Conference Table will ship the same or next business day. If you need your new conference table even faster, choose the Expedited Production option when you're designing your table, or Expedited Shipping during checkout. We offer these upgrade options to make sure you have your table when you need it. We don't just stand at our conference tables, we stand behind them as well; your order includes a 30-day free trial period, so you can be sure your UPLIFT Desk conference table is exactly what your meeting room needed. Our industry-leading 7-year warranty will give you peace of mind, and is included with your purchase at no additional charge. The 7-year UPLIFT Desk frame warranty covers the electrical components, control box, and mechanical parts of your frame. For even longer protection, upgrade your coverage to the 12-year Extended Warranty. What kind of desktop does the Height Adjustable Conference Table have? With so many desktop options, you'll find a style that fits what you're looking for! Choose from our wide selection of stock solid woods, 1" thick bamboo, reclaimed fir, dark brown or natural rubberwood, or for a more traditional office look, try a white Eco or classic laminate. Is this a conference table or a standing desk? It's both! This height adjustable meeting table is designed to give you and all your meeting participants more movement and more energy in the office. More activity throughout the workday can improve productivity and health, defending against the negative effects of a sedentary lifestyle. But I can sit at this table, right? What kind of chairs should I get? You can use any chairs that feel comfortable to you! Take a peek at our selection of ergonomic seating options to get inspired. Just how adjustable is this table? This conference table adjusts to fit most users, with 25.6" (650mm) of height range, from 24.4" to 50.0” (without desktop thickness). You can add a further 1.5" of height to the table if you like, with a set of UPLIFT Desk Casters. What kind of keypad does this table have? This conference table comes standard with a 2-button "Push and Hold" keypad that will allow easy height adjustment. For more features, including the ability to save 4 preferred heights in memory for one-touch adjustments, upgrade to the Advanced Digital Memory Keypad, so you can start your meeting faster and seamlessly transition from sitting to standing. Does this conference table have the same three-stage frame as your other height adjustable desks? All UPLIFT Desk frames are three-stage, including the Height Adjustable Conference Table. Your table adjusts 33% faster thanks to an independent motor in each leg, as opposed to the single motor used in most competing frames. A 33% greater adjustability range ensures your conference table will fit a wide group of users, from more petite users to tall people, so everyone can be comfortable. I don't live in the United States. Can I use this conference table with my outlet and voltage? UPLIFT Desks are designed to operate on the US electricity standard of 120V. If you are ordering an UPLIFT conference table for use outside the United States, you will most likely need to plug it into a step down transformer before connecting to a power source. Without a transformer, you run the risk of overloading your table's control box. Overload by plugging into an improper power source is not covered by warranty. If you have any questions at all regarding how your country's voltage works with this table, please contact our support team by phone, email, or chat. I actually ordered this because I needed a desk that was a little bigger. I absolutely love the Pheasant-wood live-edge desk I purchased. It is a beautiful piece for my office! $739.00 List Price: $2,199.00* The list price is the same as the MSRP (Manufacturer's Suggested Retail Price). It may not necessarily be the price at which the product is sold.